Colorful characters, desperate times. The Civil War unfolded in Florida much differently than in the sister states of the Confederacy, with skirmishes fought in salt marshes, the cavalry saddled up to drive cattle northward to feed hungry soldiers, and Federal gunboats tempting escaped slaves to freedom. Florida’s pivotal role in the War Between the States started with shots fired in Pensacola (the same evening as Fort Sumter was attacked in South Carolina) and continued to play out along the state’s coastline and rivers. Providing thousands of volunteer troops to battlefields far from home, providing luxury goods smuggled into coastal ports by blockade runners, and providing crucial commissary supplies such as salt and beef to starving Confederate troops, Florida supported the last gasp of the Confederacy through the end of the war. 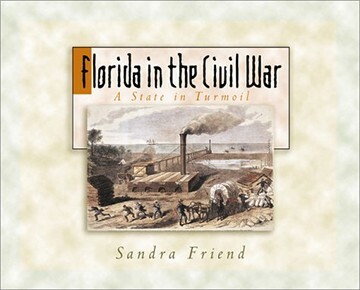 From battles over divided loyalties to the insistence of Governor John Milton never to surrender, Florida’s Civil War history unfolds through the accounts of its participants. Library binding. Two color, 96 pages. OUT OF PRINT.